Is the BDP-51FD a wolf in sheep's clothing? The BDP-51FD is a scaled-down version of Pioneer's LX71 with a more recession-friendly price tag, but aside from some cosmetic differences and minor circuitry substitutions, it's essentially the same player – great news all round. But like the LX71 it's a Profile 1.1 player, which enables you to watch BonusView PIP extras, but not BD-Live, which is a real let down. Compared with some other decks, the BDP-51FD is absolutely massive, sporting chunky bodywork that tells you it means business. Happily, Pioneer's gorgeous gloss-black finish makes it as elegant and desirable as any slimline deck. The rear panel is packed with connections, including 7.1-channel outputs, a HDMI output, optical and electrical digital audio outputs, and isolated stereo audio output for music playback. The Pioneer's audio decoding talents are a cut above some of the other players, too. 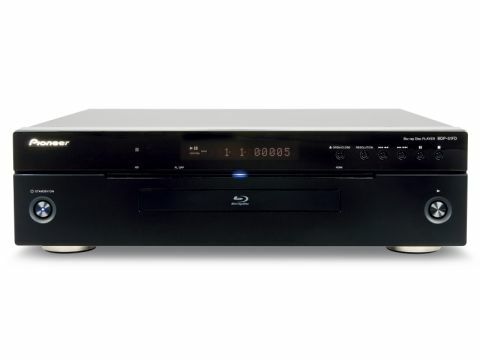 It can decode Dolby True HD and DTS HD Master Audio and output them over HDMI as LPCM, plus it can output Dolby True HD and Dolby Digital Plus from the multichannel analogue outputs. It can't do the same for Master Audio yet, but apparently an imminent firmware update will enable this feature. Elsewhere on the spec sheet the BDP-51FD's video DAC has been downgraded to a 148.5MHz/12-bit version, but this doesn't affect the quality of pictures from the all-digital HDMI output. Other features include Deep Color support, 1080p DVD upscaling, the Precision Quartz Lock System to improve CD playback over HDMI and the Video Adjust menu, which enables you to optimise the picture in a number of areas as well as select presets for different types of display. Multimedia support is typically excellent for a Pioneer player, with a compatibility list that includes DivX, AVCHD, MP3, WMA and JPEG. The absence of a USB port means such files have to be played from disc, but that's a tiny trade-off. Sadly, the Pioneer lets itself down in one key area: it's painfully slow to boot up and load Blu-ray discs. Some discs take as long as a minute and a half, which isn't acceptable. It's a real shame, as the rest of the operating system is superb. The black background and graphics of the setup menu give it a classy look and it's really responsive to boot, plus the remote is impeccably laid out (although the buttons are a bit small). One particularly handy feature is the Tools menu, which brings up a list of frequently used functions and means that you don't have to stop the movie and enter the full setup menu. The 51FD delivers the sort of spellbinding pictures you'd normally expect from a player costing a lot more. It's every bit as good as the LX71 and nudges ahead of the pack with jaw-dropping detail reproduction and deep, luxurious blacks that give the image more punch than Amir Khan. The amount of detail on display here is mesmerising, pulling you right into the action, while the crisp edge definition gives the image startling clarity. Dark scenes are where the player's pedigree really shines: the way it allows objects in the foreground and background to be clearly visible without compromising the solidity or depth of the overall picture is admirable, as is its shadow detailing. Colours are also beautifully rendered, whether bold, vivid colours or gentle skin tones without making either look unnatural.